Beavers are usually classified as a pest or nuisance species due to their habits of building dams. The most common complaints in Louisiana that prompts you to search for answers for beaver removal and control include the following: Area flooded due to beaver dam Creek destroyed by beaver activity Trees destroyed by beaver activity For these reasons, many people wish to have this nuisance animal trapped and removed. Most beaver trapping methods are lethal, although there are some live traps available. Beavers are best known for their damage to trees but they can dig dens into man made dams that will weaken and leak. They also build their own dams to hold the water back sometimes causing flooding into yards, fields or roadways. Several different trapping methods are used to remove unwanted beavers. Beaver problem situations may include impoundment of water threatening downstream property, upstream flooding of land, trees or crops killed or damaged by flooding, flooding of homes, roads, impairment of drainage systems, contamination of water supplies, damage to wildlife habitat or land owner distress. Control and removal of beaver is done in a safe humane & environmentally acceptable manner. Beaver are North America’s largest rodent and cause millions of dollars each year in damage to farms, agricultural property, homes and business. Do you have beavers affecting your home, farm business, or exterior property ? We offer professional help with beavers. We are professional beaver trappers and wildlife removal specialists. Please Click Here for more information on beavers. One of our primary lines of work is to remove beavers from locations where they may cause damage. Beavers that build dams that threaten to wash out roads and bridges, or that contaminate the water supply. We use the most current methods of beaver trapping, cleanup, and block out techniques. No important diseases are commonly transmitted to people by this animal. But rare cases exist. 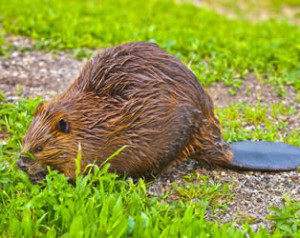 Aside from rabies, a virus found in many wild mammals, beavers have been known to spread giardia, a protozoan parasite that causes gastrointestinal distress. Other mammals, including humans, can get giardia, otherwise known by the name of Beaver Fever. Giardia lives in any water and can be present in people even if symptoms of the disease do not manifest.